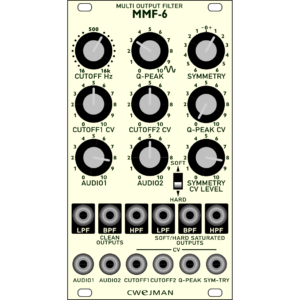 The MMF-6 is a multi mode filter with six outputs, first three from the left; “clean” low pass, band pass and high pass. Low- band- and high pass to the right are processed by three separate (for every output) saturation circuits with two modes; soft and hard. Additionally, the filter core has so called “symmetry” control for the resonance and cutoff frequency. It is possible to control cutoff so positive and negative going signals has different cutoff frequencies, from a subtle “edge” to very dramatical character of the audio signal (including frequency division effect). 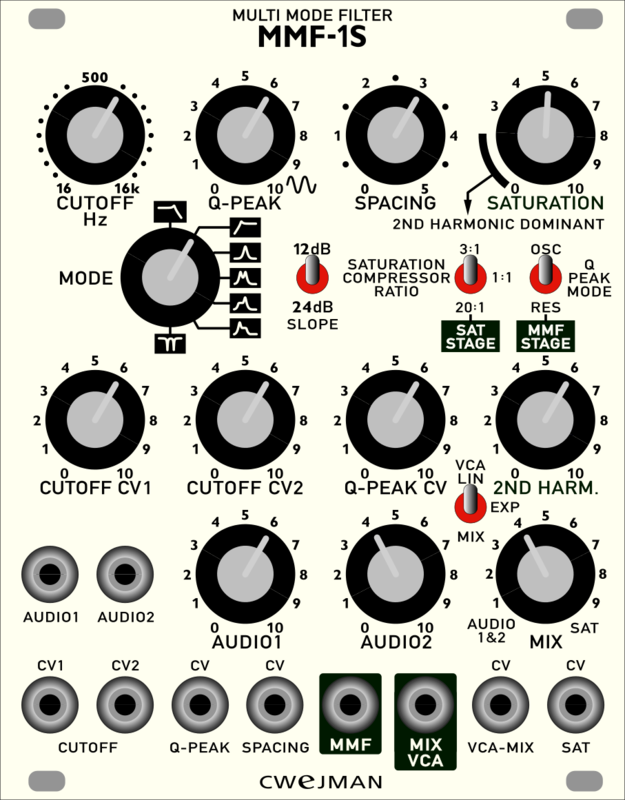 All this by modulating symmetry by one of outputs (pre-patched to “clean” low pass output) or an external signal. Now it is possible to mix clean and saturated audio signals in any combination. 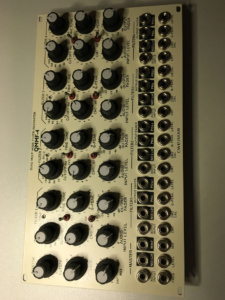 Q-PEAK : resonance control of the filter from flat to self oscillating mode in OSC SAT or OSC position and there is RES mode as a resonator. 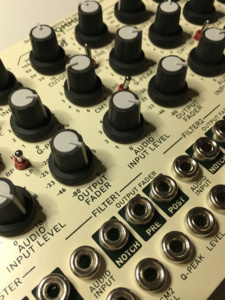 OUTPUT FADER : volume control of the filter’s output. There are 2 outputs ( PRE, POST ) . PRE is the direct output from the filters, POST is the attenuated output controlled by OUTPUT FADER and by external signals inserted to LEVEL inputs. INPUT LEVEL : audio input manual controller. 3 Filter mode (HP: High pass , BP: Band pass ,LP :Low pass ). NOTCH output : a sum of lowpass and high pass. AUDIO INPUTS : individual audio inputs for all filters, pre-patched to the master control but can be used for four external sound sources. CM1 : cutoff modulation with manual BIPOLAR level control for the inserted external modulation signals. 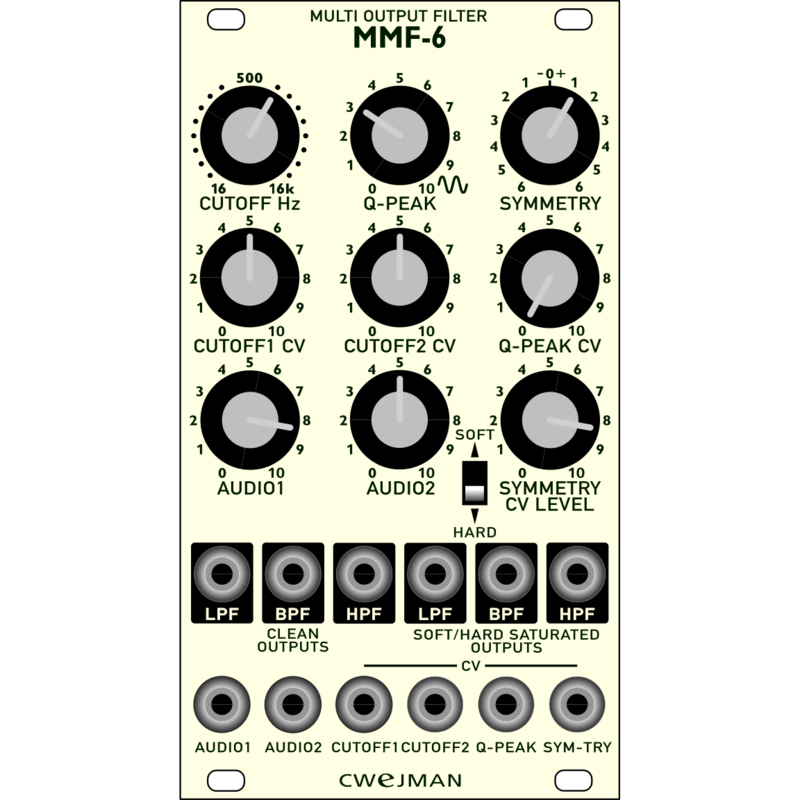 CM2 CAL: input for external modulation source and calibrated for 1 volt per octave. 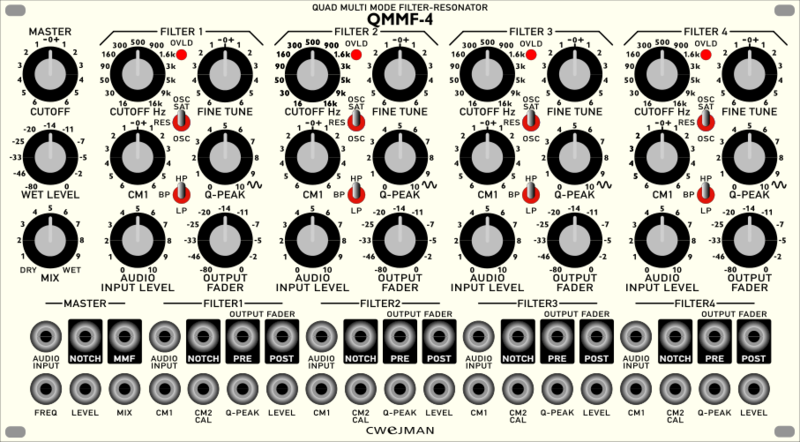 Q-PEAK : manual and voltage controlled amount of filter resonance. 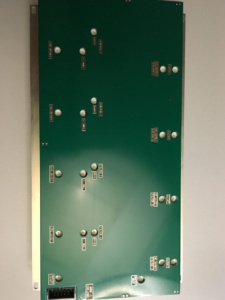 LEVEL : controlled the outgoing level of the filters (POST ) manually and by external signals. MIX : controls the mix of dry and wet signals. NOTCH : it is different from other filter notches, it is the sum of all 4 filters but with inverted phases of F2 and F4. MMF: it is the sum of all 4 filters. It creates pseudo stereophonic effect. FREQ : cutoff frequency, calibrated for all filters for 1 volt per octave. LEVEL : external signal controlled master level.